Two years ago, Iceland’s Bardarbunga volcano erupted—and it kept erupting for the next 181 days, forming the largest volcanic depression ever seen. New research reveals the extraordinary processes that transpired beneath the surface, including the formation of a magma-filled canal that measured a whopping 28 miles long. The Bardarbunga volcano began to erupt on August 29, 2014, ending finally on February 27, 2015. It was the strongest in Europe in more than 240 years, emitting large volumes of sulphur dioxide into the atmosphere and causing poor air quality in Iceland. It also produced the largest caldera ever observed—a rare and mysterious cauldron-like depression that forms atop volcanoes. Calderas are relatively rare geologic phenomena, occurring only a handful of times each century. Observations are thus exceptionally rare, and scientists are still trying to figure out what causes them and how they work. For example, geologists aren’t entirely sure if calderas are triggered by volcanic eruptions, or vice versa. The Bardarbunga eruption provided a once-in-a-lifetime opportunity for scientists to observe the formation of a caldera while it was happening. 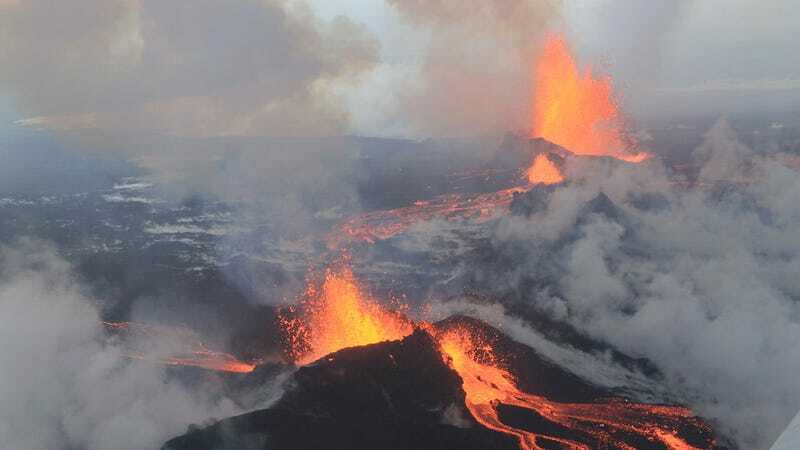 In a new study published in Science, lead researcher Magnus T. Gudmundsson from the University of Iceland, with the help of geologists from the GFZ German Research Centre for Geosciences, describe the Bardarbunga eruption in unprecedented detail. Their analysis revealed surprising insights into calderas and how they emerge. The caldera and subsequent caving-in of the land—a process known as subsidence—began when magma seeped up from a depth of 7 miles (12 km) below the surface. This magma didn’t just shoot straight up—it flowed perpendicular to the surface along an underground canal for a distance of 28 miles (45 km), before erupting as a major lava flow northeast of the actual volcano at a site called Holuhraun. During the course of the eruption, the region experienced no less than 77 earthquakes. Data shows that this flow of magma along the subterranean dike preceded the formation of the caldera, which means it drove the formation of the caldera. Over the course of six months, the ice-filled land mass above it sunk down even further, creating a massive bowl-like depression that is characteristic of calderas. During the initial stage, the ground decreased in elevation at a rate of about 3 feet (1 meter) a day. By the end, the caldera measured 5 by 4 miles wide (8 by 7 kilometers), and up to 210 feet (65 meters) deep. “With an area of 110 square kilometers, this is the largest caldera collapse ever monitored,” said geologist Eoghan Holohan, who works at the GFZ. “The results provide the clearest picture yet of the onset and evolution of this enigmatic geological process.” His team’s work showed that steeply-dipping ring faults controlled the collapse of the surface from intense depths. Tremors and seismic shocks at the eruption site sent the magma rushing back and forth along the dike, which functioned much like a two-way water hose. The chamber is located beneath Europe’s largest glacier, Vatnajokull, which was (and still is) filled with ice. But the eruption didn’t happen directly beneath the ice. “In that case, we’d have had a water vapour explosion with a volcanic ash cloud even bigger and longer lasting than the one that followed the eruption of Eyjafjallajokull in 2010,” said Thomas Walter from the GFZ. For comparison, the Bardarbunga eruption spewed out two cubic kilometers of volcanic material over the course of several months, nearly ten times more than the Eyjafjallajokull. Insights gleaned over the course of this research project will undoubtedly help scientists understand other calderas, including the ominous kettle located at Yellowstone in the United States, or those in the Andes region. Back in 1815, the Eruption of the Tambora volcano in Indonesia led to a caldera and a devastating tsunami. Volcanic aerosols and ash in the stratosphere brought on the infamous “year without summer” in 1816.